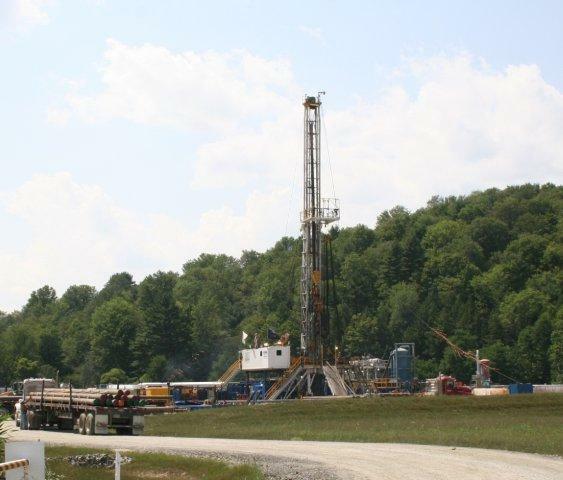 New Yorkers have an additional thirty days to prepare comments on high-volume horizontal hydraulic fracturing. At the outset of today’s DEC hearing in New York City – the fourth and final public hearing – a DEC spokesperson announced that the deadline for public comment has been extended an additional month, until January 11. The decision came in response to numerous requests from environmental groups and others who wanted more time to sort through the humongous 1500-page environmental impact study and the proposed rules. 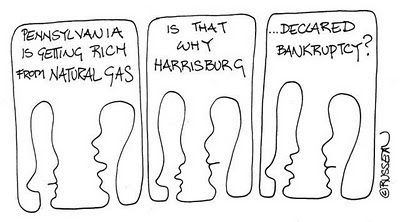 My friend, an artist, cartoonist and all around excellent person, has been doodling weekly gas-field humor for the Broader View Weekly (Chemung & Tioga Counties, NY) for the past couple years or more. Every now and then he lets me post 'em. According to attorney Elisabeth Radow, gas leases conflict with home mortgage rules. One problem: hydraulic fracturing for shale gas carries heavy industrialized risks, and those risks can spread with a ripple effect through residential communities. “A growing number of banks won’t give new mortgage loans on homes with gas leases because they don’t meet secondary mortgage market guidelines,” says Radow. Mortgages prohibit the storage, use, disposal or release of hazardous substances (including gas) on the mortgaged property. 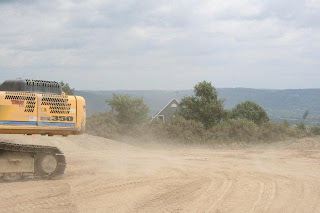 They also prohibit landowners from transferring an interest in the property, such as mineral or gas rights, without the written consent of the mortgage lender. During a recent phone conversation, Radow delved into the messy conflicts between gas leases and mortgage rules. The main problem she sees is that a gas lease redistributes traditional rights of homeownership to the gas company. “But not the responsibilities,” Radow emphasizes. One of the responsibilities that falls on the landowner is liability. That’s because the industry has not fully insured their operations, she notes. And it’s not clear whether the companies have funds reserved to self-insure to make up for a shortfall in insurance coverage. In disclosure statements filed with the SEC, both Chesapeake Energy and Range Resources state that drilling is inherently risky; drilling operations can result in injury, loss of life, damage or destruction to property and environmental clean-up. But, they caution, their insurance may not cover all those risks. In the Form 10-K included with its 2010 Annual Report, Chesapeake reported that it has $400 million in general liability insurance, Radow said. While they have interests in 45,800 productive wells, they control drilling on 25,700 of those wells – that’s about $15,500 in liability coverage for each well they’re drilling. On top of that they carry $75 million for sudden risks, such as blow-outs and $130 million for pollution liability insurance. What does this have to do with mortgages? We have a $6.7 trillion secondary mortgage market, Radow said. As shale gas extraction takes hold nationwide, if the gas company passes the liability from drilling accidents onto the homeowner and the homeowner defaults on his loan, and pension plans and others investment vehicles have invested in the secondary mortgage market …. “I see potential for another serious secondary mortgage market impact,” Radow said. Bubble or no, there are other potential financial problems with gas leases on residential properties. Recent data show that the value of homes and property near wells is declining. If the assessed value of a property goes down, that property’s taxes could follow suit. On a municipal-wise basis, decreases in the assessed value of homes near drill sites could affect the rest of the town by increasing what they pay to make up for that loss in tax revenue. Even people who don’t lease to gas companies could find their finances adversely affected by drilling on their neighbor’s property, Radow said. You can read the longer, print edition of this article at Tompkins Weekly. For a more detailed study of this issue read Radow’s article, “Homeowners and Gas Drilling Leases: Boon or Bust” in the Nov/Dec 2011 issue of NYSBA Journal. What does an environmental scholar do with an extra $100,000? If you’re Sandra Steingraber, you dedicate it towards the fight against fracking. 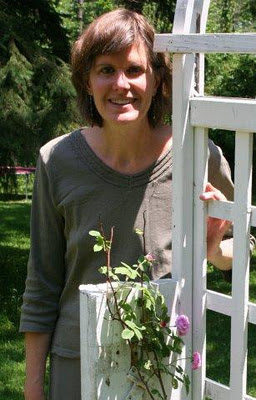 Steingraber – ecologist, author, and cancer survivor – is one of this year’s winners of the prestigious Heinz Award. She lives modestly, and readily admits that she could certainly use the money to open a college fund for her children, start a retirement account or put the cash towards living expenses while she works on another book. But she’s not going to. Instead, she will devote her award to fighting hydro-fracking here in upstate New York. This week Steingraber and other cancer survivors and medical sent a letter to Governor Cuomo warning that the rush to issue hydrofracking permits threatens to expose New Yorkers to a host of carcinogens. The state should conduct a full assessment of health risks, they say, instead of negligently exposing NY residents to the same carcinogens that have been identified in communities in other states once gas drilling began. In Texas, for example, women living in the six counties with intensive gas drilling suffered a significant increase in breast cancer rates while during that same time period breast cancer rates declined across the rest of the state. The most ominous technology, she feels, is fracking. It fractures the bedrock, fragments the landscape and divides communities, all in the name of energy security. But real security, Steingraber says, is being able to buy tomatoes, cheese, and peaches at her local farm stand. Real security is being able to drink the water that bubbles up from the aquifer beneath her feet. And that, she says, is worth fighting for. New York residents and state officials are gearing up for the hydrofracking hearings that begin this week. The NYS Department of Environmental Conservation (DEC) is holding four official hearings on the Supplemental Generic Environmental Impact Statement (SGEIS) regarding high-volume horizontal hydraulic fracturing in shales. DEC hearings will be held on Wednesday at the Dansville Middle School auditorium and Thursday at The Forum Theatre in Binghamton. Two additional hearings will be held later this month in Sullivan County and New York City. But some communities are holding their own “public hearings” sans DEC officials. About 400 people showed up last Thursday, November 10 at the State University College at Oneonta for a public hearing organized by the City of Oneonta, the Otsego County Conservation Association and Otsego 2000. State Senator James Seward opened the public forum by criticizing the SGEIS, saying they offer uneven and inadequate protection to most upstate New Yorkers. A stenographer recorded public testimony to submit to state officials, who are expected to give it the same consideration as comments taken at the four upcoming DEC hearings. The Tompkins County Council of Governments has decided to sponsor a public hearing on Thursday, December 1 in Ithaca’s State Theatre. As with the Oneonta hearing, a stenographer will record comments to submit to DEC. This hearing runs pretty late, though – from 7 to 11 pm. Plan on showing up around 6:30 to get a good seat and sign up to comment. This week's DEC hearings could be crowded. If you hope to speak at this Thursday’s hearing in Binghamton, plan to arrive early and sign in. Speakers will be limited to three minutes. You don’t have to speak to get your voice heard – written comments carry equal weight. According to DEC the agency has already received 4,200-plus comments. The draft SGEIS generated around 14,000 comments so DEC expects more to arrive as the December 12 deadline approaches. As for drilling permits for high-volume horizontal hydrofracking – they’re on hold until the environmental review is finalized. At last report DEC Commissioner Joseph Martens said it’s not clear whether any will be issued in 2012. Researchers have documented links between earthquakes and mining, underground injection wells and hydraulic fracturing. But government scientists say that last weekend’s quakes in Oklahoma were too big to be caused by manmade activities. And those quakes, they noted, occurred near a well-known fault. Tremors caused by hydraulic fracturing and other mining activities tend to be much smaller – measuring 1.5 to less than 3 in magnitude. But the potential link between drilling and quakes has triggered a flurry of interest. Now it looks like the National Academy of Sciences is going to tackle the question; the Academy has launched a study into the possible role of energy drilling in seismic activity, reports the Oneonta Daily Star. According to research agency spokeswoman Jennifer Walsh, that study should wrap up by the late summer of 2012. A swarm of earthquakes has been plaguing Oklahoma thisweekend. The quakes started with small tremors about 2.7 magnitude and increasing to a record-breaking 5.6 magnitude quake that struck at 10:53 pm CST. That quake was centered near Sparks, about 40 or so miles northeast of Oklahoma City, and felt as far away as St. Louis and parts of Texas. Oklahoma is no stranger to earthquakes – the state typically has about 50 shakers a year. But the number has increased dramatically in the last three years, with more than 1,000 earthquakes reported in 2010. Earthquakes tend to occur at the edges of tectonic plates – but Oklahoma is located securely in the middle of a tectonic plate, and there aren’t many faults. While researchers can’t say for sure why Oklahoma is experiencing an increase in earthquakes, some people are wondering whether the tremors are related to hydraulic fracturing. The area lies above the Woodford Shale, and in the past couple of years energy companies have drilled more than 1500 wells using hydro-fracking to break the rock. The Oklahoma Geological Survey has studied whether the quakes in 2010 could have been caused by fracking. Their report, dated August 2011, is still under review, so it’s not official yet. But you can read it here. Meanwhile, earlier this week Cuadrilla Resources, a British energy company, recently admitted that its hydraulic fracturing operations likely triggered “a number of minor seismic events” that shook the UK this spring. And last spring an earthquake swarm around Guy, Arkansas was thought to be due to injection of drilling wastes into underground wells. Just in case you don't remember how to contact EPA to report drill spills, some folks have posted a reminder in large print. Given the recent spill in Hopewell, this is valuable information. The billboard is paid for by NEPA gas action, a group that has had a billboard with three glasses of water displayed for more than a year in Susquehanna County. But ParkOutdoor - the folks who own the billboard - declined to run that particular ad. Apparently they received complaints that it was "controversial". Those complaints came on the heels of them cancelling a pre-paid ad contract for the "Fix It" billboard. 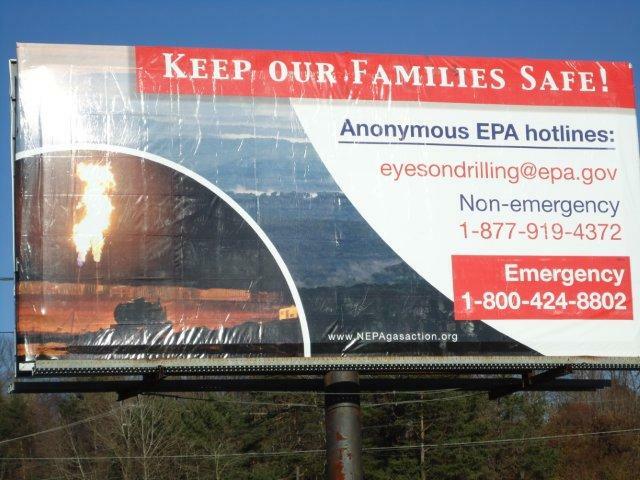 The NEPA gas group believes Cabot complained about the billboard. "ParkOutdoor caved to the industry, who spends more money on ads than we do or can," said one activist. While ParkOutdoor is honoring the contract for this billboard, they told the group that they did not know whether they could accept anymore contracts. "It's amazing to think that a billboard advertising a government emergency hotline would be declined as being controversial,"said the activist. Yesterday morning (yes, Halloween) Range Resources reported a spill of “treated” wastewater near a drill site in Hopewell Township, Washington County, PA – just a bit west of Pittsburgh. The 16,800-gallon spill (400 barrels) happened at 9:20 am when a contractor tried to move a temporary water line using an excavator. 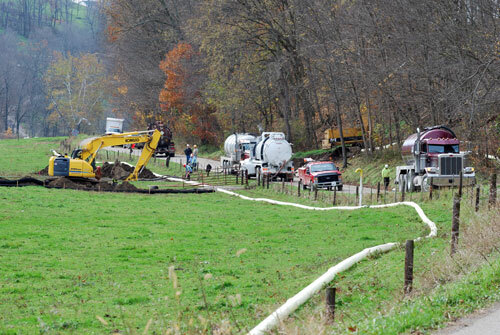 The pipeline was installed to deliver treated flowback fluids to the impoundment at the well site. There it would be mixed with fresh water, stored, and recycled in future fracking operations. Though no fluids were being pumped through the pipeline at the time of the accident, there was residual fluid from a previous transfer. The PA Department of Environmental Protection (DEP) told the press that the spill area was ditched and contained… then added that some recycled fluids entered a high-quality stream. Although DEP didn’t know how much waste fluid had reached the creek, a spokesperson said that preliminary tests showed no impact on aquatic life in the water. Range spokesman Matt Pitzarella called the incident “unacceptable”. But he’s said that before, because this is the third spill Range has had in as many years. That spill happened when the company was pumping fluids from the hydraulic fracturing of three wells through a six-inch pipe to a “DEP-approved” impoundment. Along the way, two screws along the pipe came loose. Pitzarella chalked it up to vandalism. Range spilled another 10,000 gallons or more of flowback fluids in yet another accident that same year. That spill also resulted in a fish kill. Pitzarella said that Range found “…both of these to be unfortunate and unacceptable.” But, he added, neither spill had any negative impacts on health or property.